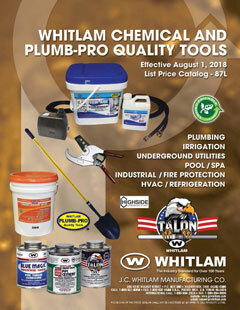 In 1900, J.C. Whitlam Manufacturing introduced a joint compound that changed the way plumbing was done. We have continued the proud tradition by using top notch engineering and innovative methods to provide safe, effective and modern options for sealants, solvents, equipment and more. Whitlam products are available across the world, with more than 80 Manufacturer's Representitives in North and South America and 6,000 wholesalers. To download List Price Catalog - 87L (Effective August 1, 2018) click here.